Students from Simcoe Composite School were given an assignment from their Civics teacher to research a charity or service and fundraise for it. The goal was to educate the students about the charities and social services available in the area. 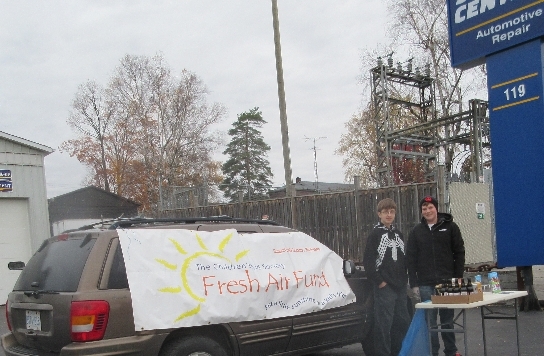 These young men picked the Fresh Air Fund and held a bottle drive on Saturday October 31, 2015 in Port Dover. Their amazing efforts brought in $236.75. Pictured in the photo is Cole Gamble and Clayton Dorish. Absent from photo but still part of the group was Daniel Chappell. Thank you very much gentleman for turning bottles into cash and helping children go to camp.